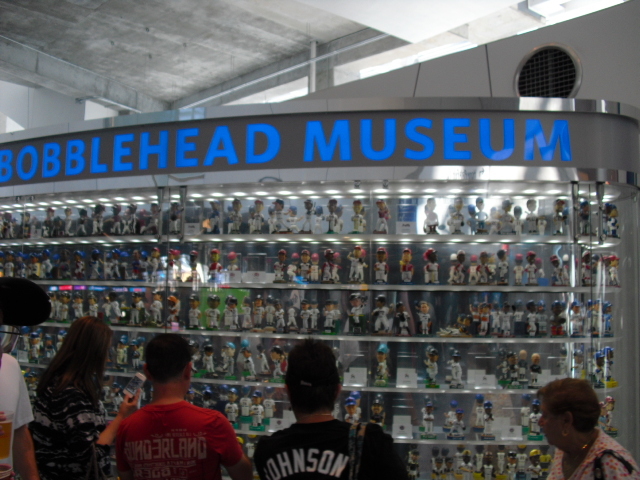 Before I start, I apologize for the delay in this post, as I made my quick baseball trip to Florida from March 31st to April 3rd, but with the busy-ness that my baseball season brings to my life I haven’t had time to compile this post. Also, many thanks to my Grandma and my Uncle who made this trip possible by sharing their residences, and time, in Florida. 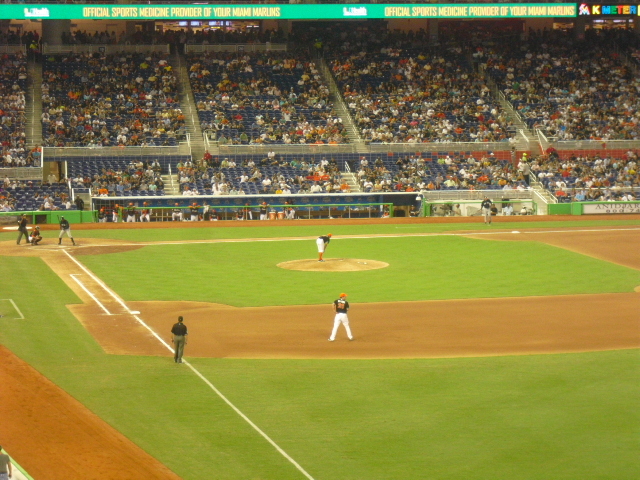 The game I attended at Marlins Park was on April 2nd, an exhibition against the Yankees. It was the day after I visited Jupiter to see the last spring training game of this season at Roger Dean Stadium. I had club level seats on the first base side for the game in Miami, decent territory for foul balls. On the morning of April 2nd, we departed my Uncle’s house near Port St. Lucie, and made our way down to Miami, about an hour and a half ride. I wanted to get to the Little Havana area earlier than normal for any baseball game because we had to first find our parking lot (I had used ParkWhiz.com to secure a spot just a block or two from the Park), and second, we had to eat. 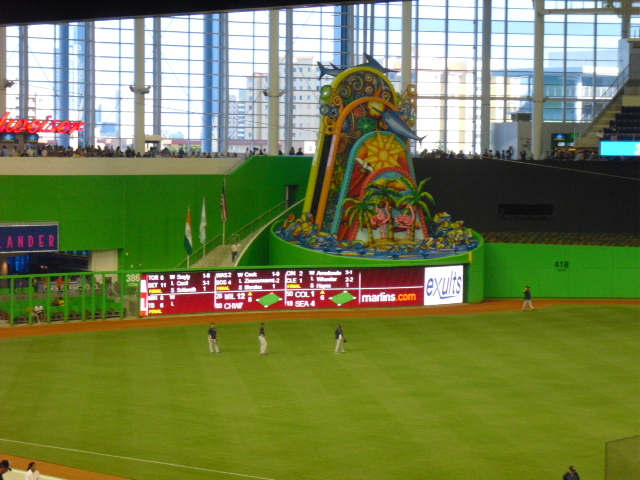 Off of I-95, Marlins Park is just a few minutes if you know how to navigate the neighborhood, but we did not. Unfortunately placed construction, coupled with my Uncle’s fearless driving nearly got us arrested as a cop flagged us down when my Uncle drove the wrong way on a one-way path through a construction zone. Some of the street signs in Little Havana are not clearly marked, and the GPS didn’t help. Luckily some strategic sarcasm by both the cop and my Uncle kept us from trouble. 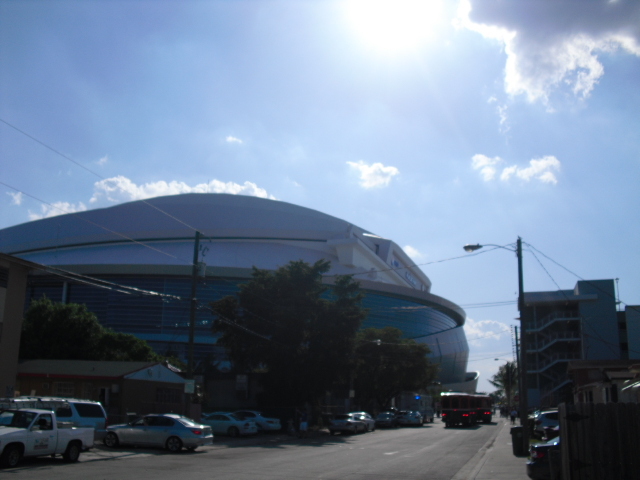 I don’t remember how, but we eventually got around the construction and through the neighborhood and found our parking lot in the shadow of the looming Marlins Park. 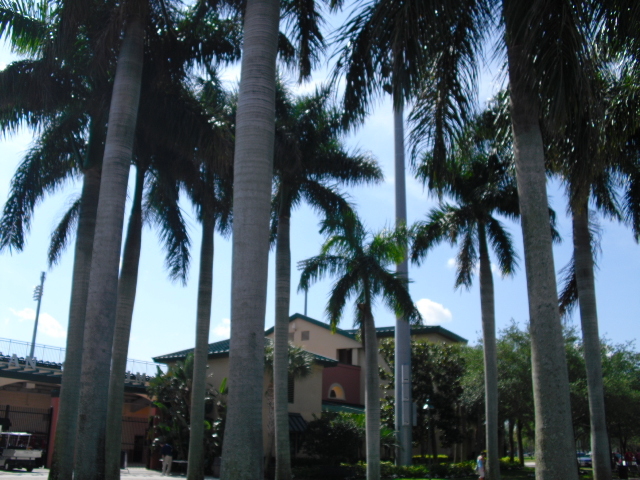 The Park is technically in Northwest Miami, but it is just a few minutes from Southwest, into which the Cuban-condensed neighborhood extends. So we drove into Southwest and ate at a quaint Cuban place called Versailles Cafe. 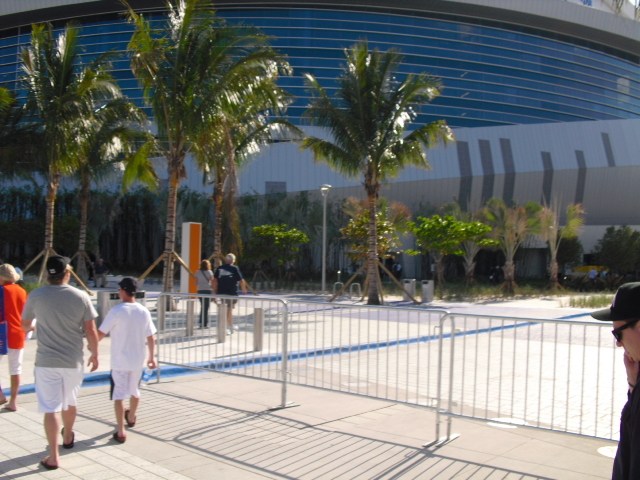 Now on regular game days, Marlins Park opens 90 minutes prior to first pitch, but for games expected to be crowded, it opens two hours prior. I didn’t know whether or not this game would be a so-called “premium game,” but as we approached the Park a little after 5 p.m., people were already streaming into the stadium. Except when I attempted to enter the left field seats, I was stopped by the usher checking tickets, I looked around to the other sections in the area, and there were ushers guarding each. So I asked the lady whether or not I had to have a ticket for the section in order to enter. “Yes,” she replied with a cordial smile. “Even for batting practice?” I asked. “Yes,” she said. Darn! The front office was raving about how fans would love the new park, and how nice the staff members were. This is true that the staff members were extremely nice, but it bugged me beyond imagining that I couldn’t go anywhere during batting practice. Every section guard I asked responded with the same friendly grin as if they were the storm troopers to Jeffrey Loria’s Darth Vader, except with smiles. So far, so not-that-great. The whole batting practice ordeal bugged me the whole night, and spoiled the trip for me really. I was able to sneak past temporarily occupied security guards to go down to the left field corner section, but no batted balls reached me. Randy St. Claire was the closest Marlins coach or player to where I was able to be in left field, and as Zack Hample can attest, he is the single, least fan-friendly person in the baseball world. He will simply not acknowledge fans’ existence. I have seen him, literally, run in front of players fielding ground balls during BP and steal them away, probably to make sure they don’t get tossed into the stands. So yeah, no chance for me in left field. I was able to sneak down into a section on the right field line during the Yankees’ portion of BP, but it was too crowded over there, and nothing came my way. Things got boring, and I knew I was going to have to take pictures and document everything cool or not cool about the stadium for various posts on this blog. 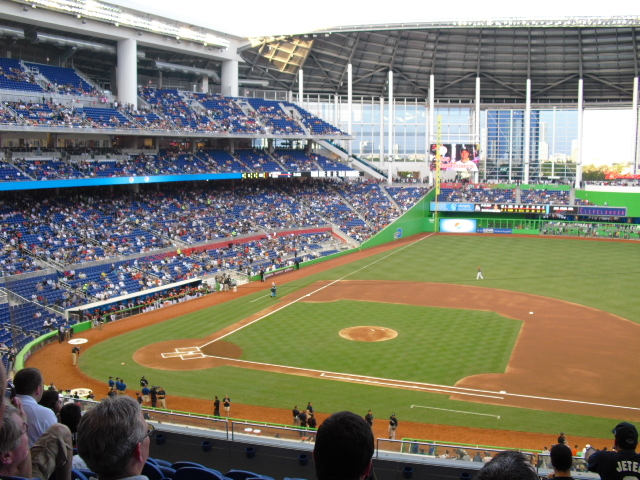 I’ve talked about most of the important stuff in the two posts: Marlins Park Logistics and Marlins Park Features. 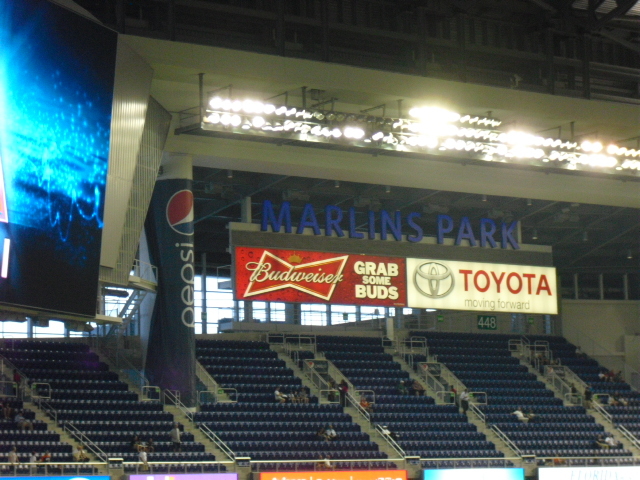 I also ranted about the stadium in Impressions of Marlins Park. So I walked the perimeter of the stadium and photographed anything I thought to be worthwhile. I eventually came around to right field and ascended a staircase to the home run porch, I thought for sure I could enter the section up there. But still the answer was no. 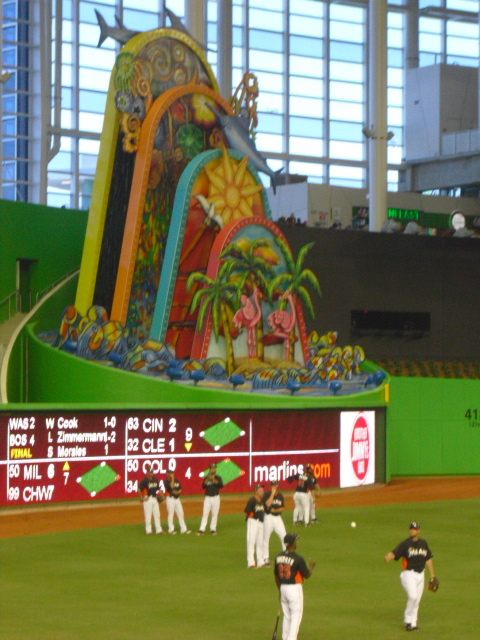 To recap, I had tickets priced at $90 in the club level on the first base side, and I was not allowed to enter the $10 section in the upper deck in right field despite an explicitly stated note on Marlins.com saying I could. With batting practice officially spoiled, and my chances of getting a Marlins Park Commemorative ball temporarily put on hold, I decided to get to my seat and just watch. 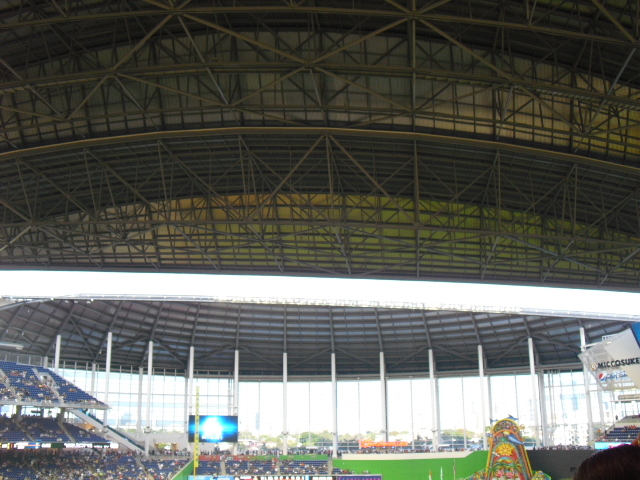 About 20 minutes before first pitch, the roof began to retract, and upon the fans’ realization of the occurrence, the ballpark erupted with cheers as the materialized dream of the Marlins was in action. 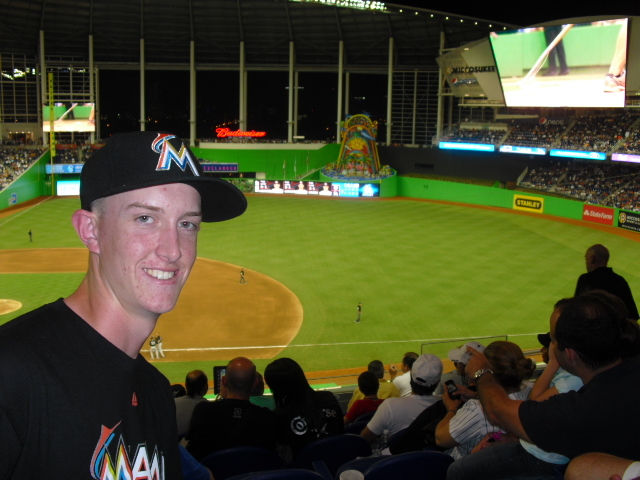 The Marlins wore orange hats (and even had helmets to go with them) with black jerseys. It was strange, and it actually looked good. I don’t know why they are not wearing the orange hats for the regular season games. During the game, I stayed in my first base, club level seat, but no foul balls even came close. The Yankees won 5-2 and that was that. It was a quick 3-day trip, and the next morning I was on a flight back to D.C.. I enjoyed the parts of Miami that I visited. But Little Havana and its surrounding areas were rather congested, and I assume the ballpark will not ease traffic in the neighborhood. 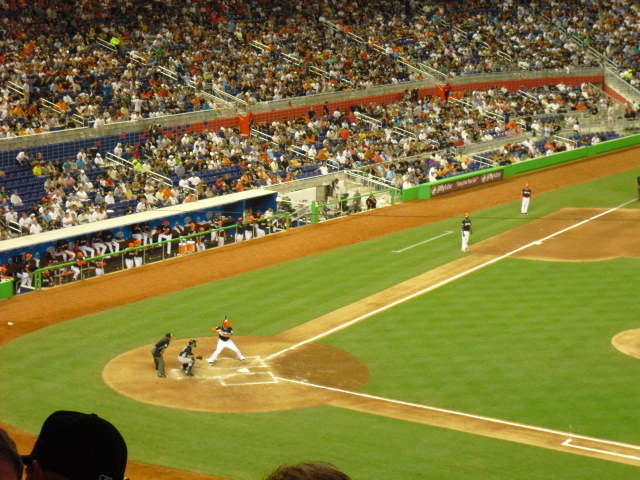 Hopefully I can return to Marlins Park in the next few seasons. The 2015 All-Star game is slated for either Miami or Washington D.C., so I might be able to attend that one. And I am sure Miami will make the playoffs in the coming seasons, so who knows, I could be at a Marlins World Series game. In Review: The city was cool, the ballpark itself was unique and fun to visit, but ballhawking stunk.